America says people have the right to complain. | Love free speech or leave. Article written by Michael E. Arth in 1971 during the Vietnam War era when patriotism was being used as a weapon against those critical of government policies. 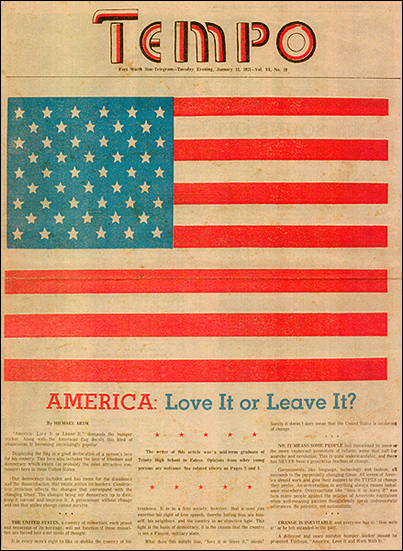 America: Love It or Leave It? “America: Love It or Leave It,” demands the bumper sticker. Along with the American flag decals this kind of chauvinism is becoming increasingly popular. Displaying the flag is a good declaration of a person’s love for his country. This love also includes the love of freedom and democracy which exists (in probably the most attractive containers) here in these United States. Our democracy includes and has room for the dissidence and the dissatisfaction that exists within its borders. Constructive criticism effects the changes that correspond with the changing times. The changes bring our democracy up to date, keep it current and improve it. A government without change and one that stifles change cannot survive. THE UNITED STATES, a country of minorities, each proud and tenacious of its heritage, will not function if these minorities are forced into a set mode of thought. It is every man’s right to like or dislike the country of his residence. It is in a free society, however, that a man can exercise his right of free speech, thereby letting him see himself, his neighbors, and the country in an objective light. This light is the basis of democracy. It is the reason that the country is not a Fascist, military state. What does this simple line, “love it or leave it,” mean? Surely it doesn’t dare mean that the United States is intolerant of change. NO IT MEANS SOME PEOPLE feel threatened by some of the more exuberant promoters of reform, some that call for anarchy and revolution. This is quite understandable, and there has NEVER been a generation fearless of change. Governments, like language, technology and fashion, all succumb to the perpetually changing times. All lovers of America should work and give their support to the TYPES of change they prefer. An overreaction to anything always causes imbalance elsewhere. Overreactions like “love it or leave it” can turn many people against the policies of American capitalism when well-meaning patriots thoughtlessly speak undemocratic utterances. Be patriotic, not nationalistic. CHANGE IS INEVITABLE and everyone has to “flow with it” or be left stranded in the past. Sounds like some Columbians. When faced with questions or complaints, they fire off “If you don’t like it, leave”. Apparently they want only compliant residents that keep quiet and always trust the judgement of the elected officials. This town needs residents who ask and ask and ask again until they get answers. What this town does not need are resident sheep being led to climb the tax ladder.